Looking for an evidenced-based methodology to help create your STEM curriculum? Wanting to learn more about a model that includes inquiry, is phenomenon-based, and incorporates the science and engineering practices? 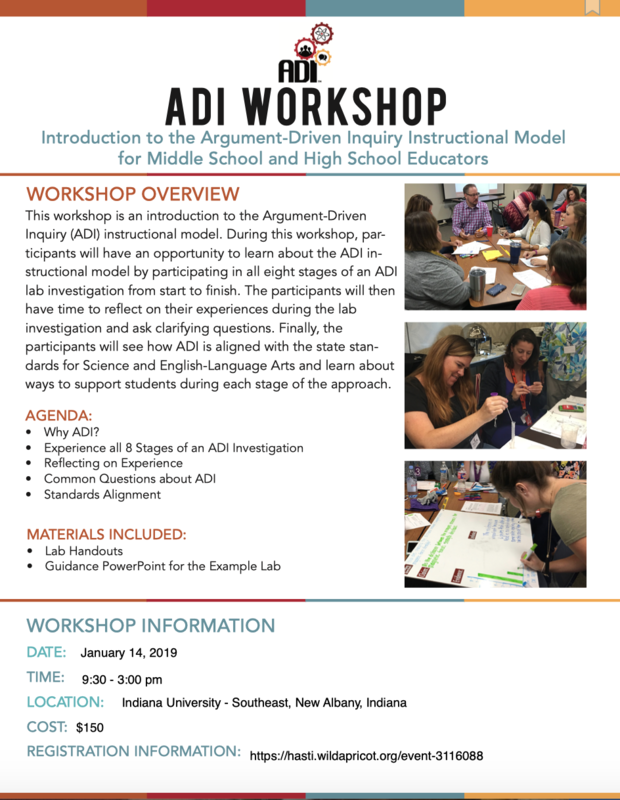 The opportunity to participate in this instructional model – Argument-Driven Inquiry that is evidenced based is coming to Indiana. Learn how the 8-stages of the ADI model can be utilized in K-12 classrooms and align with math and language arts standards as well as the K-12 science standards. Don't delay - sign up today! Lunch - Lunch is available for purchase in the food court. There is no longer a catered lunch available for purchase. Professional Development Credits. Consult your school's administration regarding paperwork. HASTI does not provide forms but will verify on your forms of your attendance. Payment - Checks and credit card payments are accepted. Refer to invoice generated once registration is completed for details. If using a purchase order contact Carolyn Hayes, Executive Director for details. Payment must be received prior to workshop. THIS WORKSHOP IS SPONSORED BY HASTI.